If your industrial processes create hazardous waste, it will be your responsibility to make sure that these potentially toxic and harmful materials are disposed of in a safe and environmentally friendly manner. Rather than creating a hazardous waste management plan on your own, you can hire a company that specializes in waste disposal and recycling near Atlanta. Your waste management team will help you create a safe and effective solution for effectively processing your hazardous waste. Read on for a look at what you need to know about industrial hazardous waste disposal . Hazardous waste should be reduced whenever possible. While it may not always be possible to completely reduce or eliminate the amount of hazardous waste that is generated by your business, it is important to cut down on your hazardous waste generation whenever possible. To reduce the quantity of hazardous materials that are created by your business, you can look for ways to substitute hazardous items with non-toxic products. It may also be possible to upgrade your industrial equipment with parts and equipment that cut down on hazardous waste. Hazardous waste must be disposed of in accordance with regulations. Federal regulations mandate that industrial hazardous waste must be disposed of using proper methods and materials. If you neglect to follow your federal or local waste disposal guidelines, you could end up facing steep fines and other penalties. A waste management company in your area will be able to answer any questions that you may have about industrial waste disposal for your business. Hazardous waste needs to be placed in the proper receptacles. When hazardous waste enters the water supply or soil that surrounds your industrial facility, it can create serious environmental problems. To protect the environment and prevent serious repercussions, industrial facilities must place their hazardous waste in designated trash receptacles. If you are uncertain about how to safely manage the industrial waste that is created by your company, do not hesitate to consult with an experienced waste management professional. Over the course of an average workweek, your office building may generate considerable amounts of solid waste. Some examples of common office building waste products include litter, paper products, and electronic goods. By encouraging your employees to recycle and scheduling weekly trash pickup services, you can cut back on the waste that your office building sends to the landfill. A company that offers waste management services can help you create a targeted plan that will help you cut back on your office waste near Atlanta. Read on for an overview of some helpful waste reduction tips to implement in your office building. In today’s digital era, many forms of business communication can be completed online or over the phone. In order to reduce waste in your office building, you may want to encourage your workers to rely on electronic forms of communication, rather than printed memos and faxes. By cutting back on the number of paper letters and memos that you print out every day, you can achieve terrific waste reduction over the course of a business year. Office supplies, such as staplers, pens, and glue sticks, will all take up space when they are tossed in the trash and sent to the landfill. To cut back on the waste that is created by your office, you may want to encourage your workers to take care of their office supplies. Capping pens, avoiding stapler jams, and closing up glue containers will help these supplies last longer before they have to be tossed. Recycling is one of the best ways to reduce office waste and help the environment. When you create a new recycling program for your business, you will need to make sure that all of your workers are on board with the plan. Along with placing recycling bins throughout your office space, you may want to hold a meeting where you discuss the importance of recycling. Creating recycling incentives and rewards can also help to encourage your workers to recycle. Recycling serving Atlanta can be done in quite a few different ways . Recycling can be broken down into downcycling and upcycling, and the latter is also known as creative reuse. In some senses, creative reuse is the most productive form of waste disposal because it aims to turn unwanted or unused items into something more practical or valuable. You can apply the principles of creative reuse to almost anything, and thinking outside the box can go a long way. Keep reading if you’d like to learn a little bit more about creative reuse. The purpose of upcycling and creative reuse is to add value to an existing product. This is in contrast to downcycling, which takes a product and recycles it in a way that gives it less value. Upcycling is particularly popular in the art community. With a creative eye, you can take old, broken, or worn out products and use them to create interesting sculptures, still life paintings, or unique photographs. By repurposing old materials that would otherwise be thrown away, you save room in landfills and get to enjoy more valuable products. 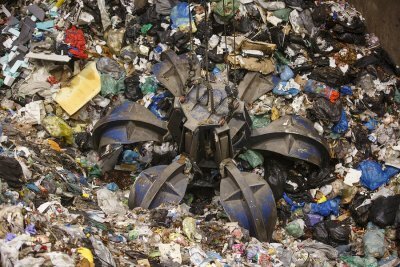 As is the case with all recycling, this goes a long way in protecting the environment. If you want to bring recycling serving Atlanta to your school, you’ll need to take some time to prepare. You will need help and resources , so start by talking to your coworkers and forming a team. Then think about your waste disposal needs, like how many recycling receptacles you should have on the property. A professional waste management company can help you roll out your recycling program and make sure it all goes according to plan. 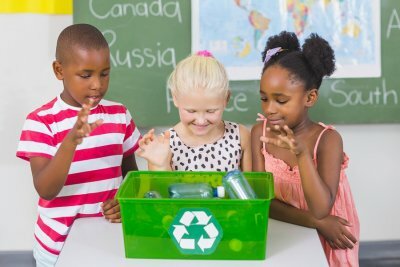 Here is a closer look at how to implement a recycling program in your school. 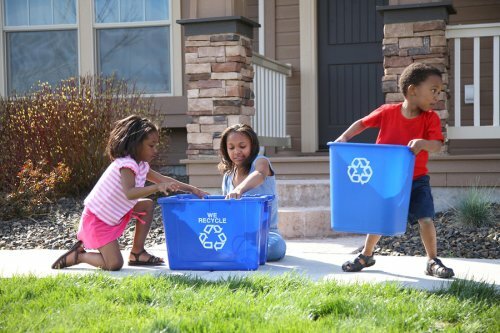 A successful recycling program is a team effort. Everyone needs to be on the same page when you start your recycling program, or it won’t be as effective as it should be. This means there should be a meeting between students, teachers, and staff members to ensure that everyone is aware of the new policies so that they can be carried out successfully. If your school doesn’t already have one, you can put together an environmental club or another organizational team. The more backing you have, the more successful your recycling program stands to be. Before you can get started with your recycling program, you will need the appropriate materials. Recycling bins are among the most important elements to include. Think about how big your campus is, and consider its layout. Remember that people will be more inclined to use a recycling bin if it’s readily available. If they can’t find one, they might use a trash can instead or even end up littering. The bigger your campus, the more recycling receptacles you should have. Make sure to place them in areas with plenty of traffic to maximize exposure. The point of waste management services is to help empower and encourage people to do their part to protect the environment. The professionals can offer you more advice that you can use to make the most of your recycling program, and they can supply you with the materials and resources you need in order to make it a success. What Are the Benefits of Using a Compactor or Baler? If you are looking for an efficient and eco-friendly waste management tool for your business, you may want to consider renting a compactor or baler. Compacters are unique pieces of equipment that can help you reduce the size of waste and recycled items before they are sent to the dumpster. A company that offers dumpster rental near Atlanta can help you rent or buy a compactor or baler that is the right size for the needs of your business. To highlight the advantages of renting new waste management equipment, let’s take a look at the benefits that a compactor or baler has to offer you. As the owner or operator of a commercial business, you will need to find ways to save on your operating costs whenever possible. When you start to notice that your monthly disposal fees are higher than you would like, it may be time to use a compactor or baler. By reducing the overall size of your waste or recycling, a compactor can help you cut back on your disposal fees. Over the course of a week or month, your business may generate large volumes of solid waste. Before your waste is sent to the recycling or waste management center, it must be stored in a dumpster or another sturdy container. When you use a compactor or baler to compress your waste, you will free up additional storage space for other items that are related to your business. When you rent a compactor for your business, you will increase your company’s potential to generate revenue through recycling. Once your recycled goods have been compacted and baled, they can easily be sent to the recycling center. Your recycling team will quickly count or weigh your baled recyclables and provide you with cash on the spot. Over time, you may find that recycling your waste, rather than throwing it in the trash, is a profitable strategy for your business. Proper waste management is essential for restaurants and other businesses in the food industry. When you watch this video from CBS This Morning, you will learn about some amazing waste management techniques that are used by a buffet restaurant in Las Vegas. Rather than throwing their excess food in the trash, one Las Vegas restaurant transforms its food waste into livestock feed. A company that specializes in recycling serving Atlanta can help you create a waste disposal strategy for your restaurant . 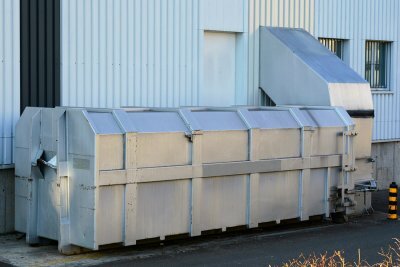 If your restaurant is in need of a new dumpster or other disposal tools, be sure to get in touch with a team of professionals. By taking the time to create an effective waste management strategy for your restaurant, you can help you cut back on the amount of food waste that you send to the landfill. Recycling is an important part of any commercial waste management strategy. Rather than tossing all of your solid refuse into a dumpster, you may want to work with a waste management company to create a recycling program that is effective and easy to follow. 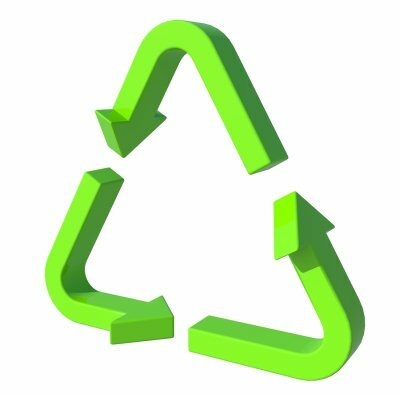 A company that rents recycling bins in Atlanta will be able to answer any questions that you may have about why recycling is so important for the Earth. Unfortunately, there are still many myths surrounding the importance and effectiveness of recycling. Let’s debunk some of the most common of these misconceptions. Some people believe that the recycling trucks that are responsible for picking up recyclables put significant amounts of pollutants into the atmosphere. If this myth were true, a recycling program could harm, rather than help, the environment. In reality, however, your recycling truck will only pick up your recyclables a few days out of the month. The emissions created during the pickup process are not significant enough to undo the positive effects of recycling. In the early days of recycling, homeowners and business owners were required to sort all of their recycled goods by type. Today, however, many different types of recyclables can be placed into the same recycling bin. Once the mixed recyclables reach the recycling facility, they will be carefully processed and sorted by machines. If the thought of sorting through your recyclables seems daunting, you may want to talk to your waste management specialists about your options for creating a mixed recycling bin. A common myth regarding recycling is that there is no reason to bother with a recycling program, since recyclables are usually sent to the landfill. While many plastic items do end up in landfills, it is possible to reduce harmful landfill waste by sticking to a recycling program. You can even ask your recycling company to provide you with information about the facility where your items will be processed. 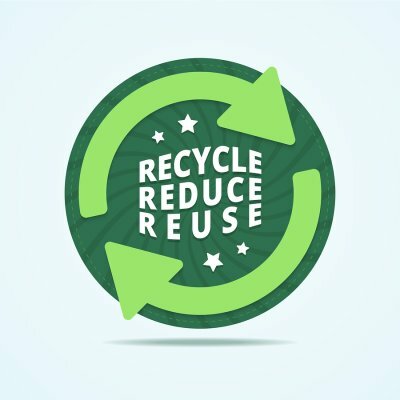 As a business owner, it’s important to think of the best ways that your company can reduce, reuse, and recycle in Atlanta . Your local waste management company can provide you with valuable information about local recycling centers and key recycling facts that will help you implement a comprehensive recycling program in your building. Here are just some of the ways that you can reduce, reuse, and recycle throughout your company. Most businesses generate a lot of waste, but you can reduce the waste you generate in a number of ways. Instead of printing out documents, develop an internal messaging system through which you can convey information to employees. Set up an e-billing system for vendors and clients so that you no longer receive paper copies of bills. Encourage employees to only use non-recyclable office supplies when it is absolutely necessary. The person who is in charge of ordering company supplies can also contribute to your efforts to reduce, reuse, and recycle. You can order green products that can be recycled, or that are biodegradable and won’t contribute to hazardous waste or pollution. You can also purchase recycled and recyclable paper and packaging materials. When it’s time to replace office appliances, you can opt for appliances that are energy-efficient and that won’t contribute to pollution and hazardous waste. When you contact your local waste management company about garbage disposal and junk removal, you should also ask for some important recycling facts. Your waste management company can provide you with recycling bins to place around the building to encourage visitors and employees to recycle. If you’re in need of junk removal, you can find out if any items are eligible for scrap metal recycling, cardboard recycling, plastic recycling, or electronics recycling. You may also be able to share and reuse certain items, like file folders and envelopes, throughout the company. The typical office environment creates significant amounts of waste paper, cardboard, and other materials. Rather than sending these paper and plastic products to the dumpster, you may want to consider planning and implementing a recycling program for your business. With assistance form a waste disposal company that specializes in recycling in Atlanta, you will be able to create a recycling program that is easy for all of your staff members to follow. When you start recycling, you will be amazed at the amount of recyclable waste that is generated by your business. Here is a look at the importance of a workplace recycling program. 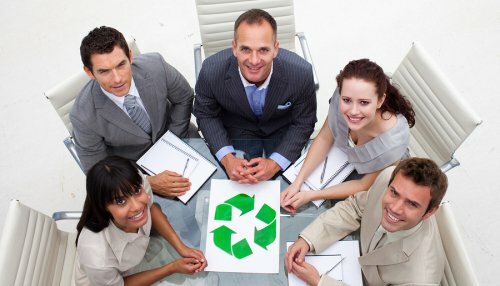 A workplace recycling program will help you improve the environmental impact of your business. With many companies choosing to go green with their management and business practices, creating a workplace recycling program is a great way to join the eco-conscious revolution. Taking steps to reduce your carbon footprint and protect natural resources through recycling can also help you draw in new customers and clients who are environmentally minded. When you create a recycling plan for your workplace, you can also help to reduce your average operating costs. Recycling paper, plastic, and metal goods will help your employees improve their awareness of the materials that they are using on a daily basis. As a result, you may find that your workers have improved mindfulness regarding conservation and reusing supplies. 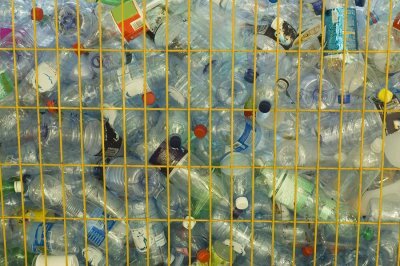 Over the course of a year, even small recycling measures can translate to significant cost savings. When you start a new recycling program in your business, this is also a fantastic opportunity to promote the eco-conscious image of your company. For example, you may want to send out a press release that offers additional information about the new recycling measures that you are taking in your workplace. Even making initial steps towards creating a recycling plan will help boost your image and profile with your community and customers.